Maurice William “Moe” Mantha, Jr. took over the reins from Terry Ruskowski as the Chill’s second head coach. Moe led the Chill to consecutive playoff appearances during his two-season stint (1994-96). His overall record was 68-60-10. A native of Lakewood, Ohio, Moe has dual American-Canadian citizenship. He was born while his Canadian father, Moe Mantha, Sr., was playing for the Cleveland Barons of the American Hockey League (1960-61). Moe Sr. had the unique distinction of playing minor-league hockey in Ohio’s three largest cities, beginning his pro career with the Cincinnati Mohawks of the International Hockey League in 1954 and ending it as the player-coach for the Columbus Checkers (IHL) in 1970. It was during that season in Columbus that the younger Moe played his first youth hockey game at age 9 in the same Ohio State Fairgrounds Coliseum that housed the Chill years later. He was subsequently raised in Canada when his father retired from hockey and returned to his hometown of Sturgeon Falls, Ontario. Drafted by the Winnipeg Jets in 1980, Moe Jr. played twelve seasons as a defenseman in the NHL with the Jets, Pittsburgh Penguins, Edmonton Oilers, Minnesota North Stars and Philadelphia Flyers. He had 370 points (81 goals, 289 assists) and 501 penalty minutes in 656 regular season games. Moe also represented the U.S. in the 1981, ‘85 and 1991 world championships as well as the 1992 Winter Olympics. 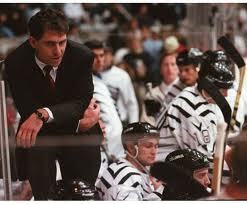 He spent one season as an assistant coach of the AHL’s Hershey Bears before accepting the Chill job. Moe became the second Chill coach to be promoted to a higher level, taking the head coaching job with the Baltimore Bandits of the AHL (later relocated as the Cincinnati Mighty Ducks). He spent four seasons with the organization, qualifying for the playoffs twice. Always known as a developer of talent, Moe coached the USA Hockey National Team Development Program’s Under-17 team in Ann Arbor, Mich., from 2000-2004 and one season with the junior Windsor Spitfires of the Ontario Hockey League in 2005-06. Moe is currently in his second season as a minority owner, general manager and head coach for the Michigan (Flint) Warriors of the junior North American Hockey League. He took the expansion team to the championship game in 2011. Moe was born Jan. 21, 1961.